Mittelspitz breeding, with quality and feeling since 1999. Mittelspitzes in all colours. For shows, obedience, agility, you name it. From home kennels to good homes only. Breeder of the Year, several times (Breed Club, Finland). Breeder of many succesful C.I.B dogs, multiple Champions, BOB winners - successes including BIG wins and placings in all breed shows as well as BIS in Speciality Show. Breeding dogs is a dear hobby for us. It is very important to us that all our dogs can do what they do best. That is to be the perfect companion. This is why we only keep 3-5 dogs at home at a time, they live a normal pet dog's life and enjoy the attention of their owner. All the other dogs we use in stud live in carefully selected homes and are living as pet dogs in breeding terms. This is how we are able to make sure that every dog has a loving environment. We feel that it is important to have a large enough breeding "stock" to be able to have the choice of selection. Only this way the breeding can develop and produce better dogs in the future. We do not need to use all of our dogs in stud or gain profit. We use only health tested dogs in breeding (eyes, patellas, sometimes even hips and elbows). 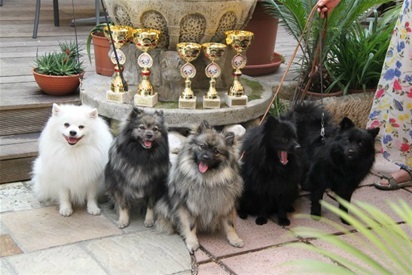 The health test are made by the Finnish Kennel Club's and Finnish Mittelspitz Club's recommendation (PL twise and eyes so that the result is never older than 2 years when the dogs are mated). A happy dog owner and a happy Mittelspitz are our priority number one!